The web site, GermanRoots has a listing of many individuals and families who left different sections of Germany and resettled in other parts of the world; some in America, Canada, Australia or New Zealand. It is call emigration when a person selects to leave their homeland. The records in the various databases can provide information on the person you are researching as well as the year and destination of emigration, spouse and children’s names and where they were born. The listing is divided by regions of Germany. Unfortunately, not all sections or towns have a viewable database, yet more are being added monthly. 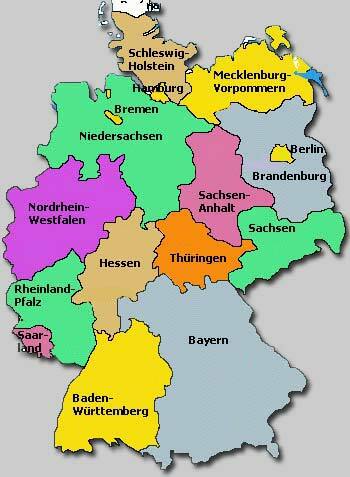 The regions available are: Baden-Württemberg, Brandenburg, Hesse, Mecklenburg, Niedersachsen (Lower Saxony), Nordrhein-Westfalen, Rheinland-Pfalz, Palatinate, Schleswig-Holstein and Thüringen. Some of the databases are in English while others are in German, but most computers have a setting to translate the German to English. Other databases you download a particular listing may be in a MS Word format. It would have to be read in MS Word, Open Office software or use the free MS word reader on the main site to download to your computer. Most of the emigration records and indexes cover the 19th century, but there some which cover from the mid-1600 and into the 1700s while others have information into the 20th century. Since the majority of German emigration came in the 19th century there are many databases which can be very useful. If you are not sure which region an ancestor came from first learn by looking at a map where these regions are located. The clue can be if there was a family legend of the lineage being from the northern or southern parts of Germany. With no clue you may have to review over several of the different databases. Most do have a search box or a listing by surname beginning letter to search. For individuals who came out of the northwest Bremen region in the early 20th century there are passenger lists for some 3,017 passengers covering the years 1920 to 1939. Also a few for 1907-1908 and 1913 to 1914 are available. Unfortunately, many were destroyed during World War II, leaving just these for researchers. To assist in other areas of researching your German ancestors, GermanRoots also has links to numerous other sources. Databases on military service, censuses, death indexes, etc. in the general information and resources page is something worth reviewing.